- You go inside a narrow cave, the red oval. 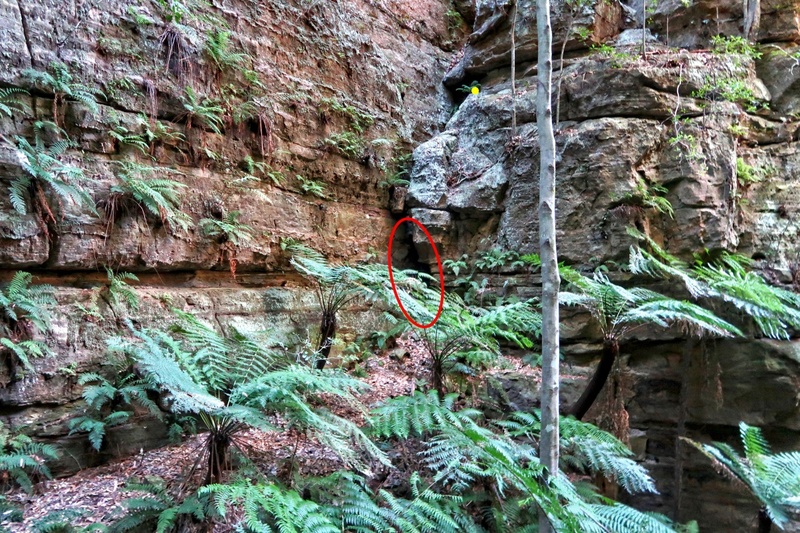 - Chimney up from inside the cave to the lower yellow dot. - Follow the short yellow arrows to the upper yellow dot. 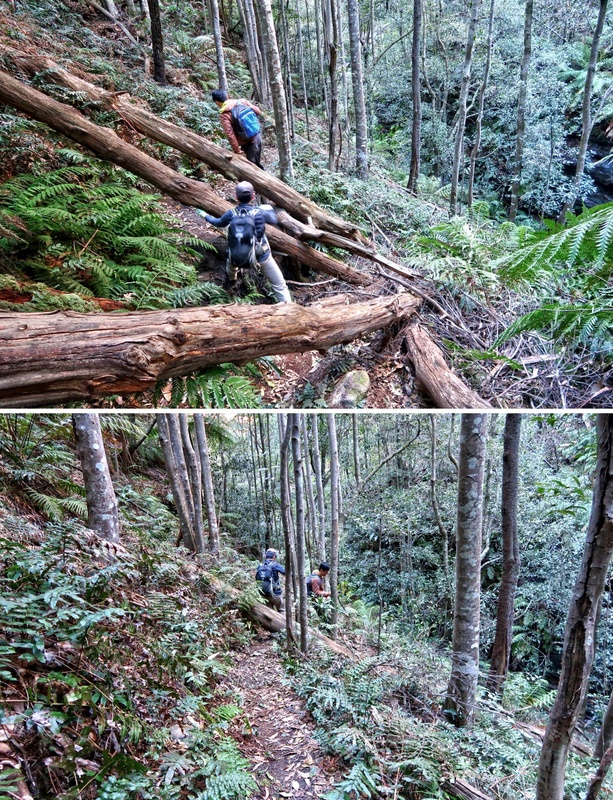 - Then scramble up a long steep ramp, the longer vertical yellow arrow. 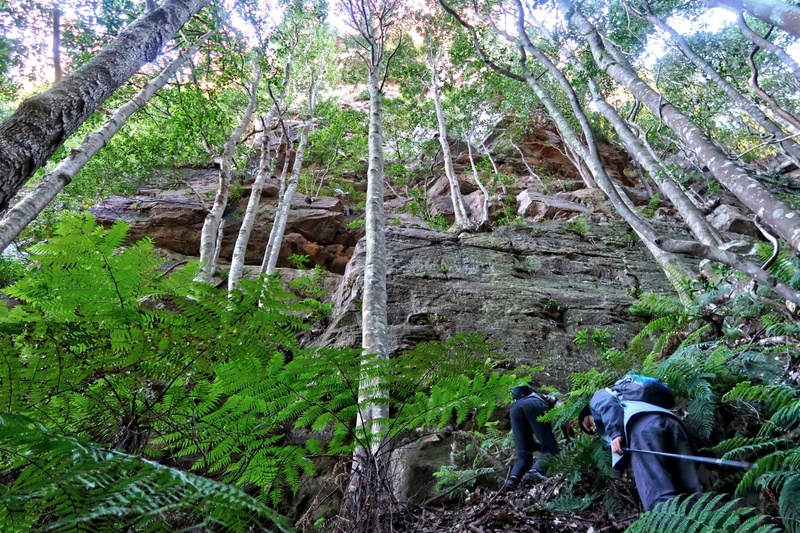 By this day and age, one would have thought that every inch of the Blue Mountains have already been walked over by bushwalkers, especially the popular areas around Katoomba / Leura / Wentworth Falls. 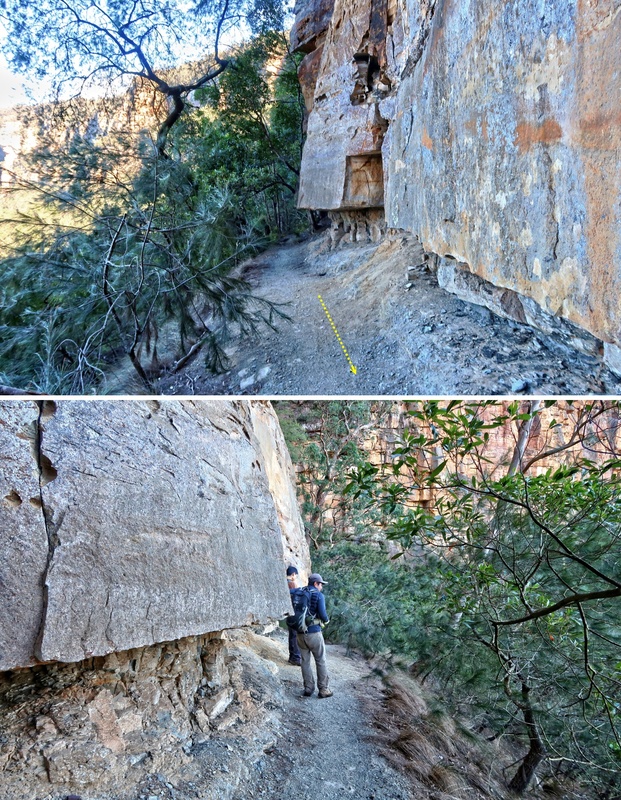 And yet it was only in November 2016, less than 2 years ago, that a guy called Mitchell Lindbeck made the first known ascent from Lindeman Pass to Fairmont Resort via Lawton's Creek. He subsequently named his route "Lawbeck Pass". 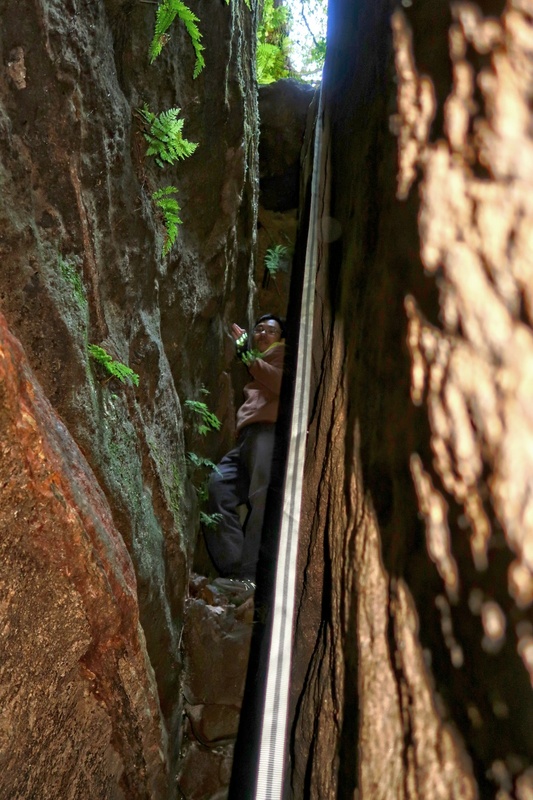 The most memorable passage of the pass is inside a very narrow cave. Inside, one needs to chimney up the vertical walls. It looks impossible and impassable. It was a wonder that Mitchell Lindbeck thought it worthwhile to scale up in 2016. No one with a sane mind had tried it in all the past centuries ! When in Lawbeck Pass, we follow the track notes given in the above link. A month ago, 4 of us, AC, James, PL and I, also tried to climb through Lawbeck Pass. 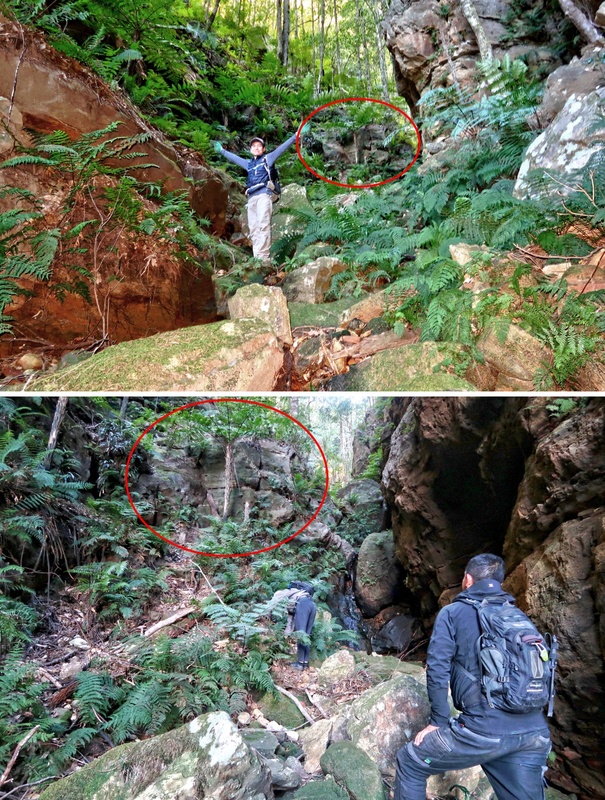 We failed at chimneying up from inside the narrow cave (photos #46 and #47) ... which explains why today, AC, YM and I are here again to have another go. 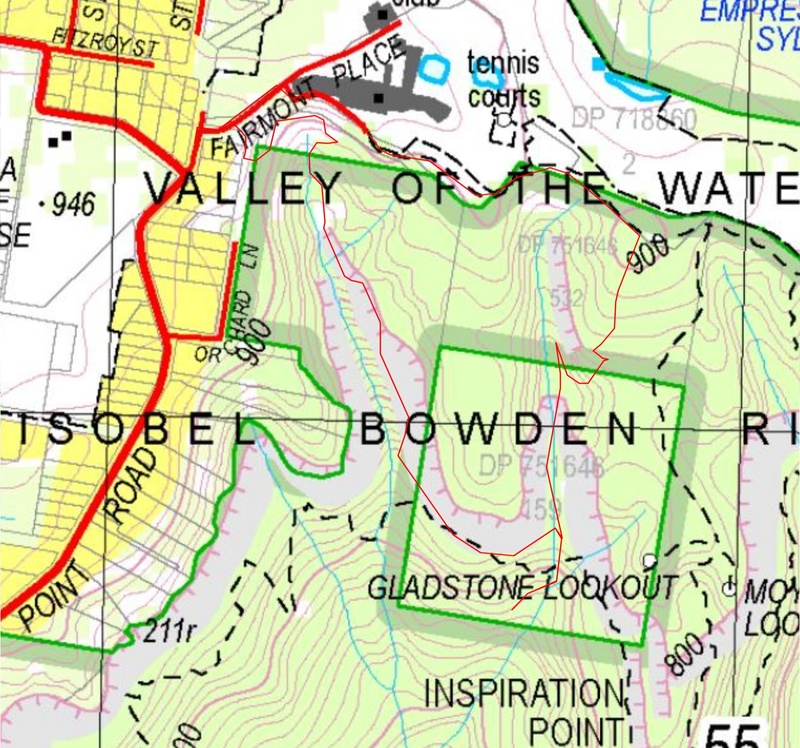 Below is the relevant part of the 1:25,000 scaled map. 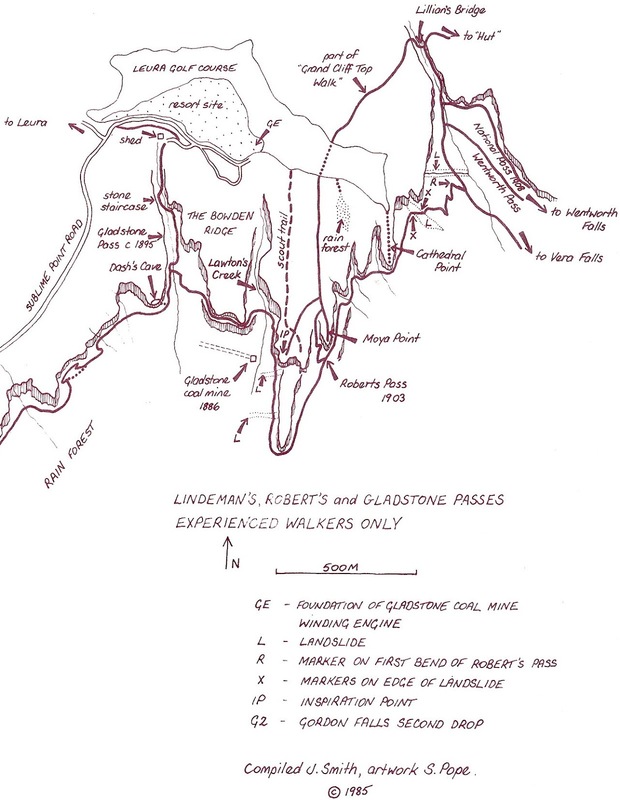 Below is a sketch map in Jim Smith's book "The Blue Mountains Mystery Track: Lindeman Pass". Lawbeck Pass is not marked on the map as the pass wasn't discovered when Jim Smith wrote his book. Here is our tracklog, thin red line, anti-clockwise circuit superimposed on the 1:25,000 map. 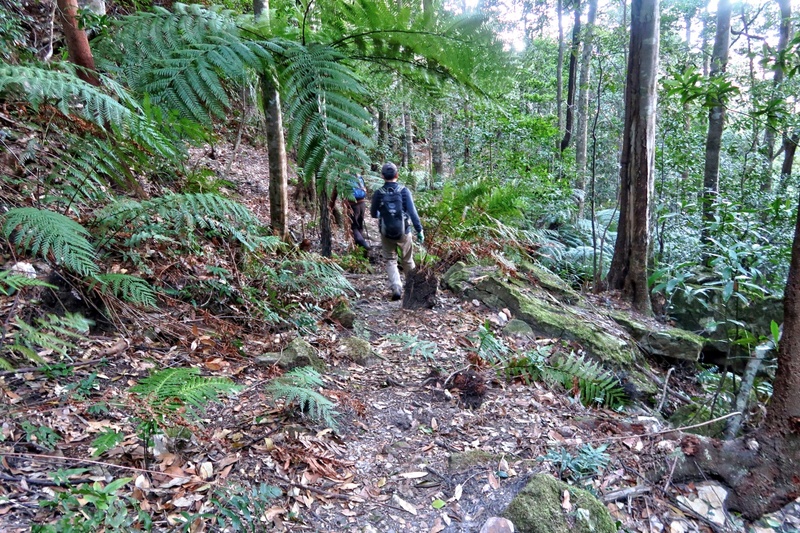 Explore a foot track which extends further away in the south-west direction. 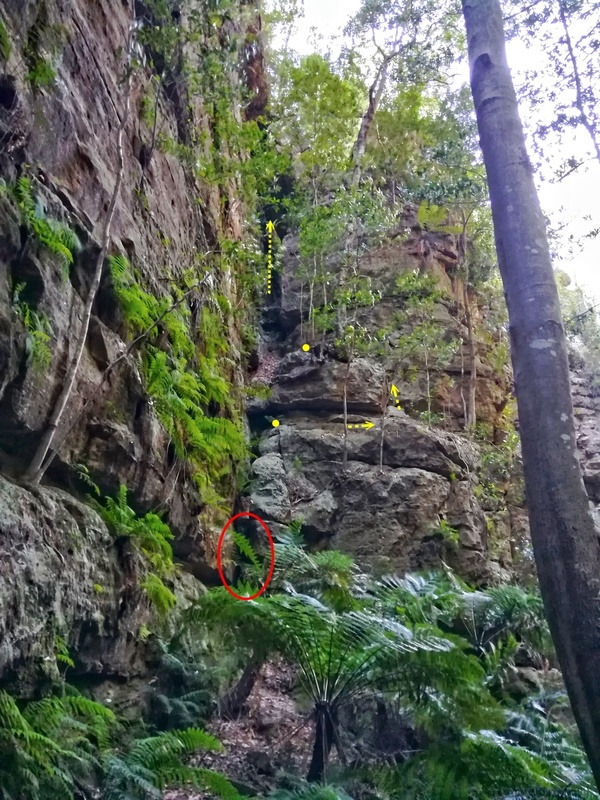 10:27 1.9 km At 1st obstacle, GR 546 649, a 2 meter high rock face to climb up. 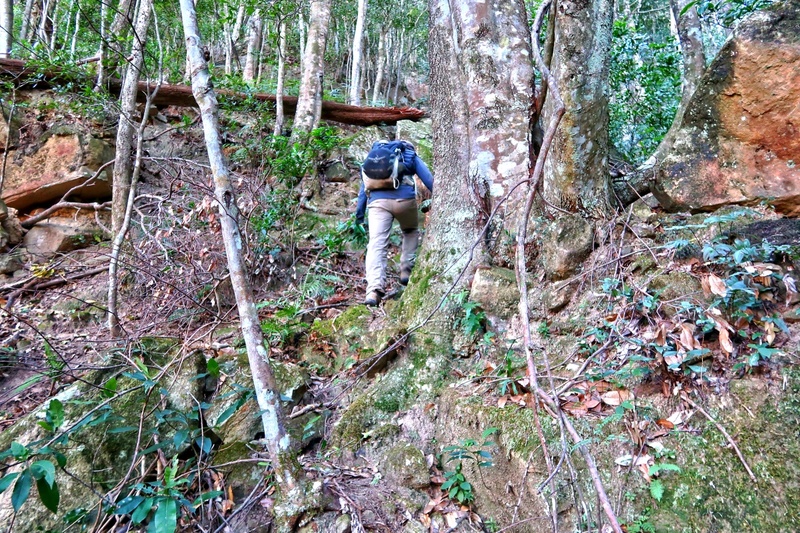 To climb up, I need to take off my backpack, and also need a hand from YM to help me. 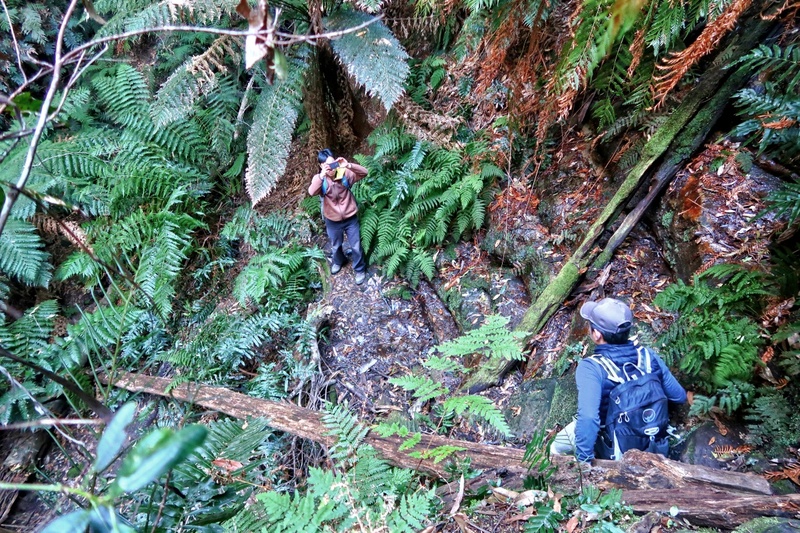 Lunch and explore up stream of Lawton's Creek to the bottom of an almost dry waterfall. 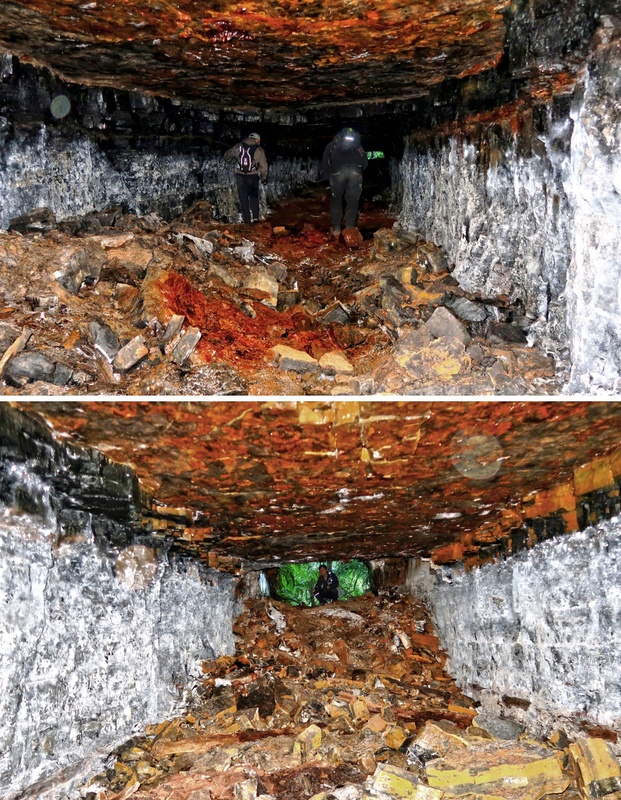 It is also the bottom of a long steep ramp filled with loose leaf litter. - Park my car just outside the entrance. - AC is taking pictures of us climbing down ... See photo #5. 5) This is the photograph that AC took ... Refer to previous pic. 6) I've climbed down the embankment and looking back at it. You should be able to match some of the features in this pic with those in photo #5. 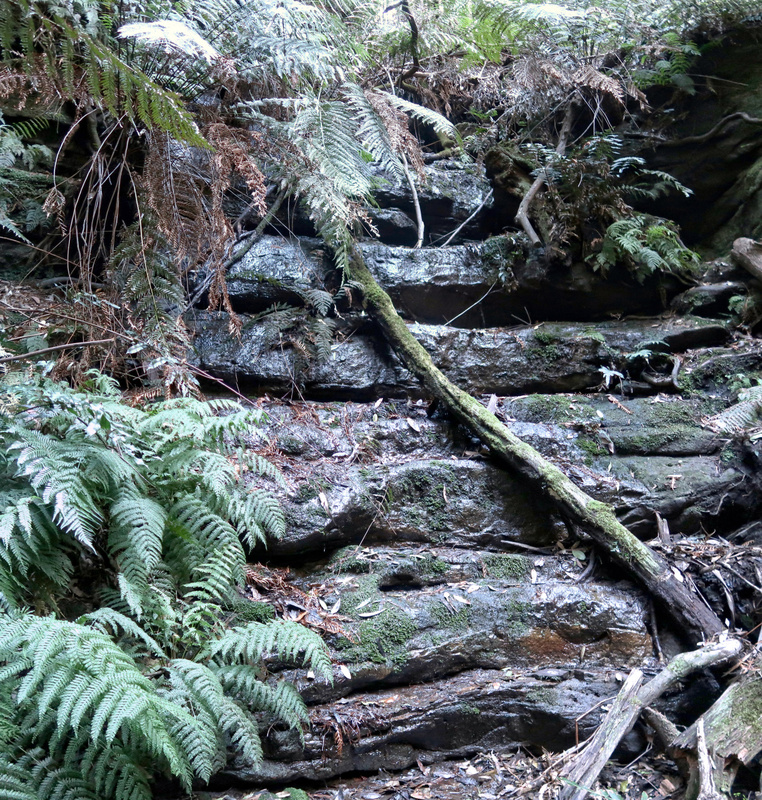 - In Jim Smith's book "The Blue Mountains Mystery Track - Lindeman Pass", this section is labelled as "Stone Staircase". 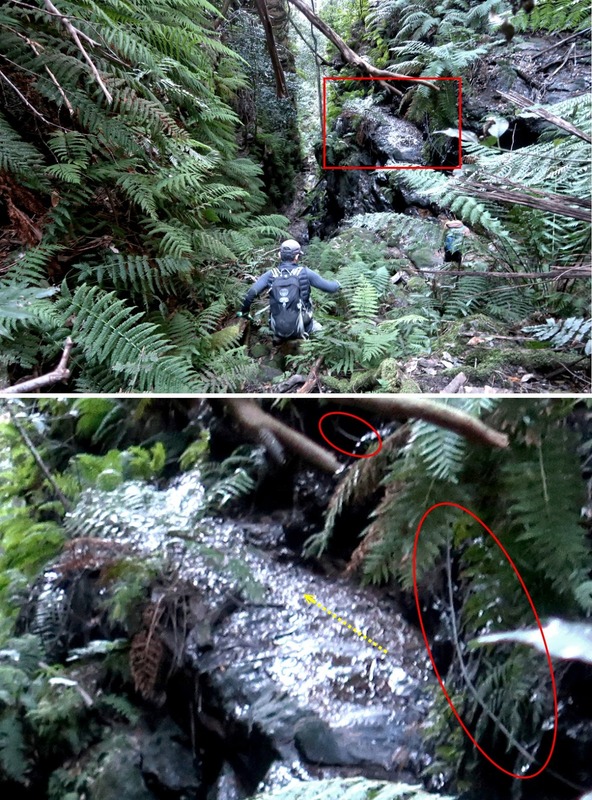 8) YM walking on the wet Gladstone Pass ... This is the section shown in the previous pic. 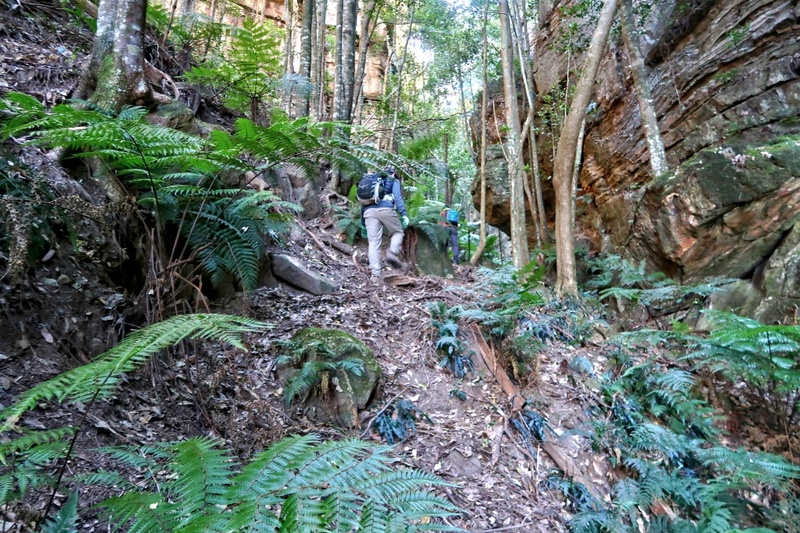 Gladstone Pass must be the wettest of all dry passes in the Blue Mountains. By now, I have walked through the pass a few times. Every time it was dripping wet even though it hadn't rained for ages. 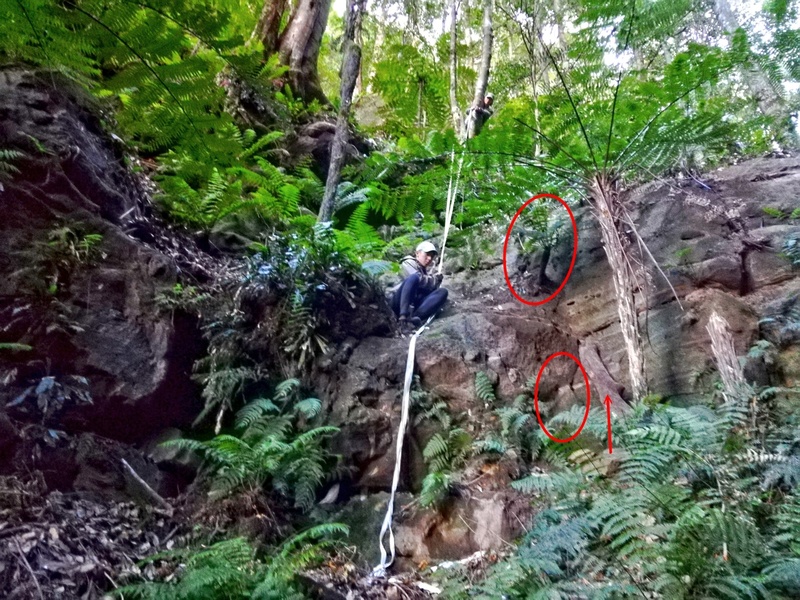 Fortunately some kind soul had installed ropes on the cliffs for us to hang on. As otherwise one slip on the wet rocks and you are dead. Wonder who installed the ropes? I don't think it was by the National Parks authorities. 11) The rope goes a long way down. • The rope is on the left side of the pic. - Lower pic: Facing forward ... I am standing at the same spot as the previous pic. • The rope is on the right hand side. 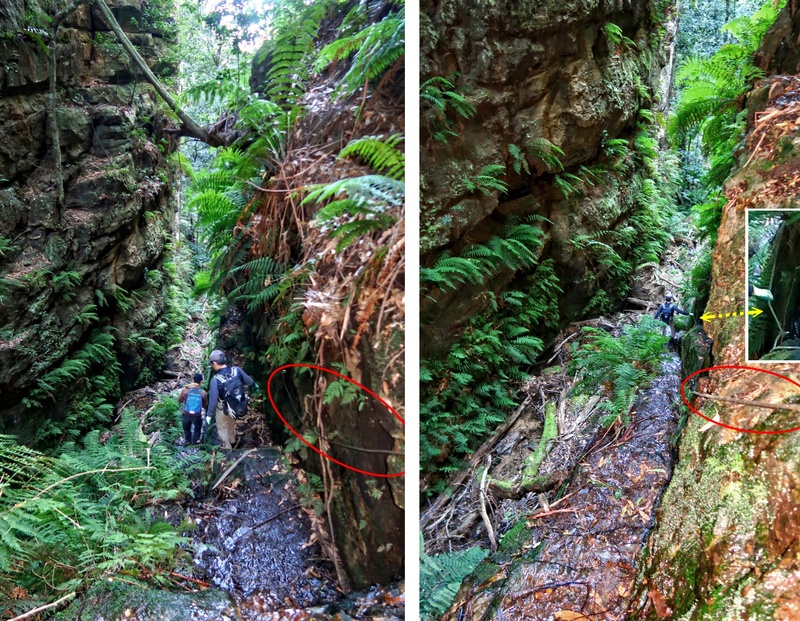 • Red circle: The fallen log here is the one in the right half of photo #12. - The rope is on the left half of the pic ... Part of it is along the stairs. 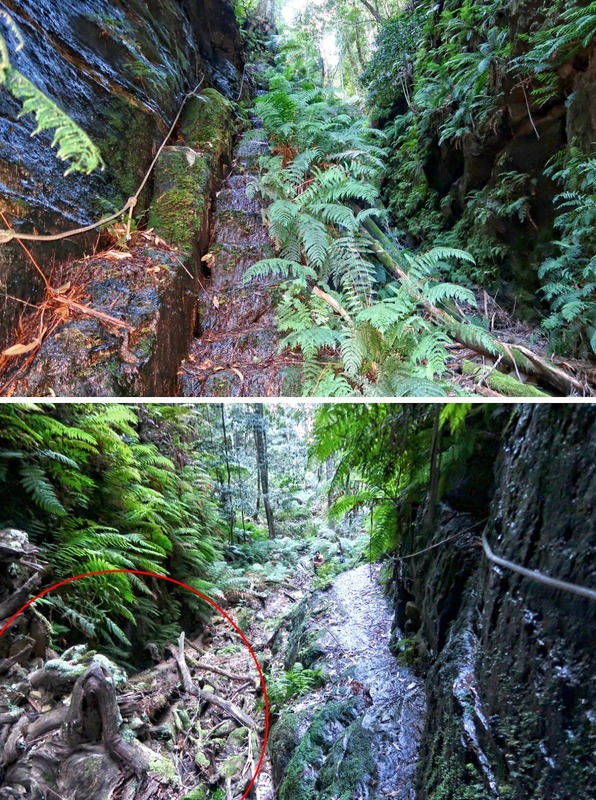 - The fallen log on the right half of the pic is the one in the red circle of the previous pic. 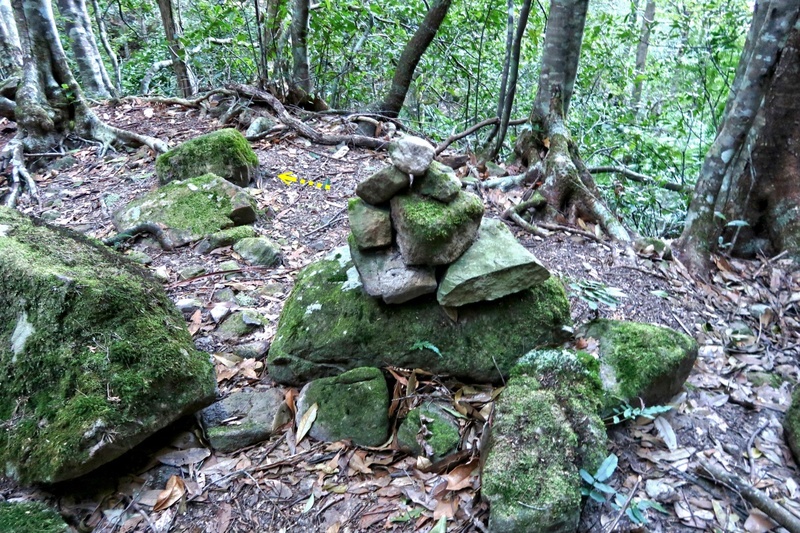 14) Cairn at the junction of Gladstone Pass & Lindeman Pass ... This is also the end of Gladstone Pass. - Yellow arrow: Direction we'll be walking along Lindeman Pass. - We are now travelling in a south-east-ish direction, toward Lawton's Creek. 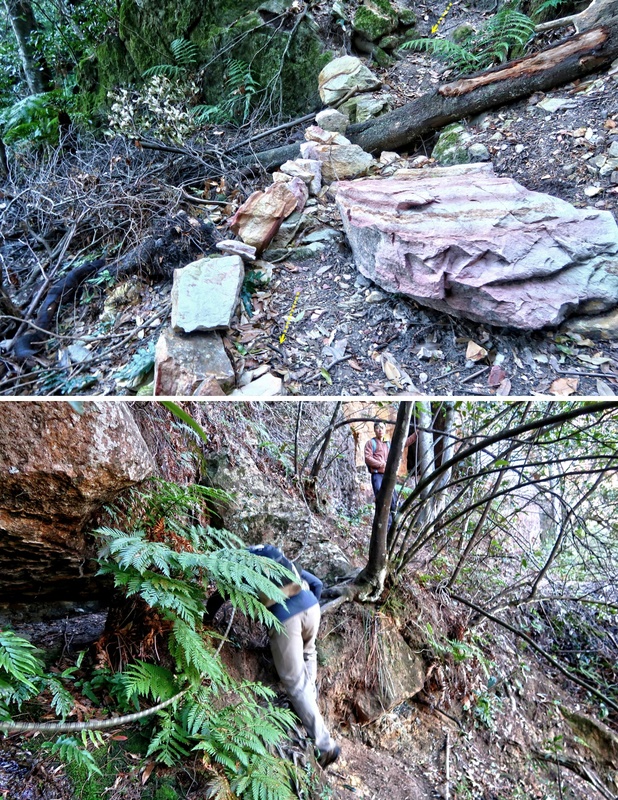 - Upper pic: These stones seems to be newly placed here. 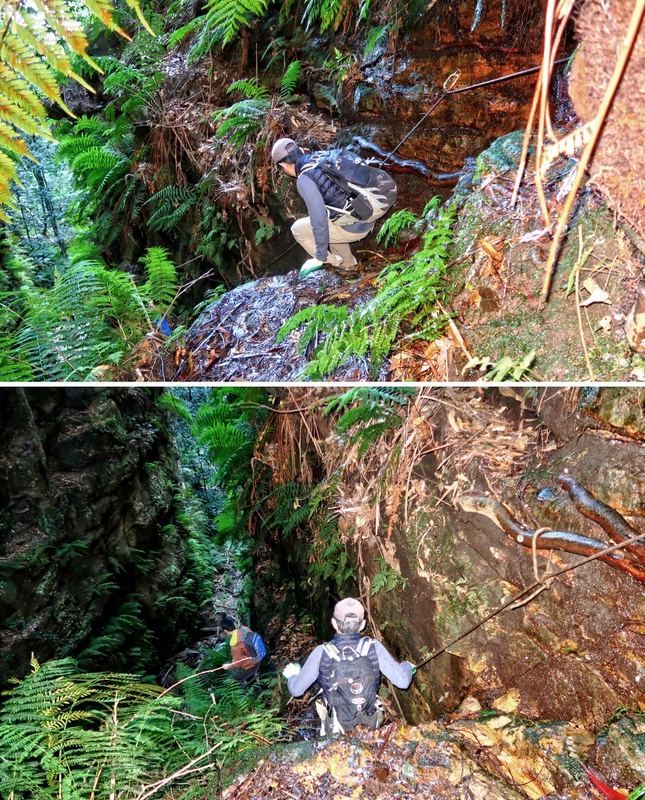 - Lower pic: The only place along Lindeman Pass where there is rope to assist us hikers. Gladstone Lookout is somewhere on top of the cliffs on the left half of this pic ... towards east. 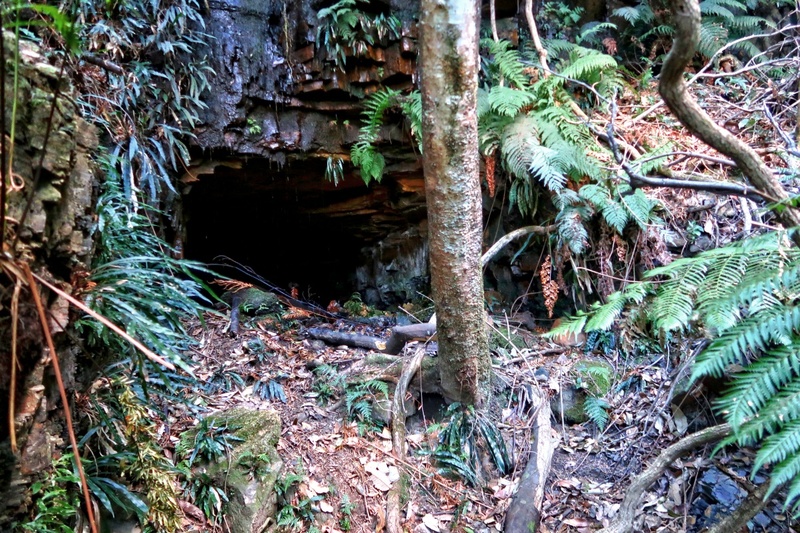 19) We've left Lindeman Pass, now climbing down towards Gladstone Coal Mine. - It is wet inside, and so we just take a look from the entrance. 23) ... Because a month ago, in an earlier trip with AC, James & PL, we went in to explore. Nothing much inside ... 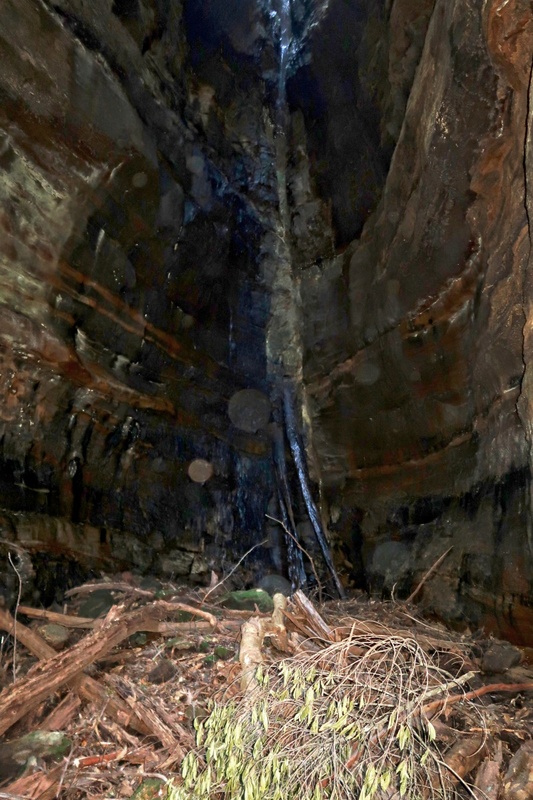 This was the pic near the end of the adit. - The 2 pics below were taken a month ago in an earlier trip. 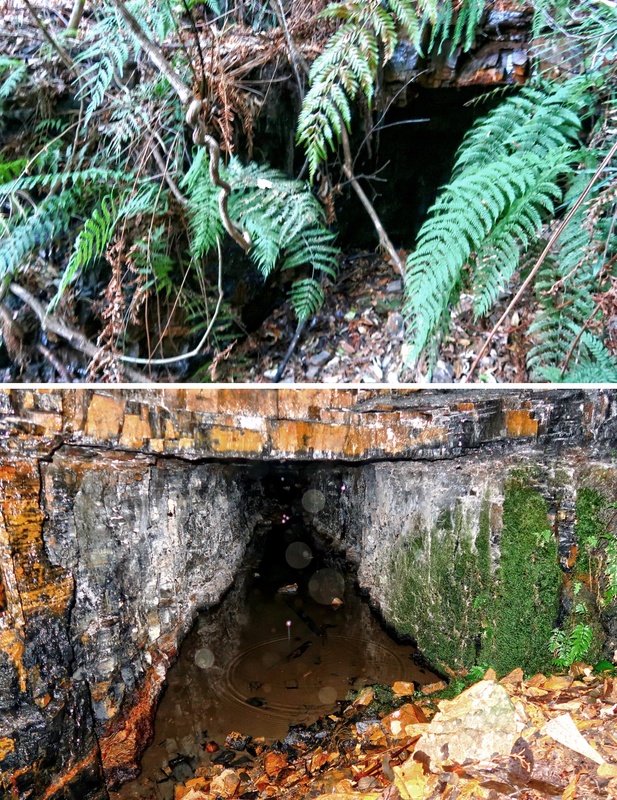 After the second coal mine, we explore around the area to see if there are more of these adits. 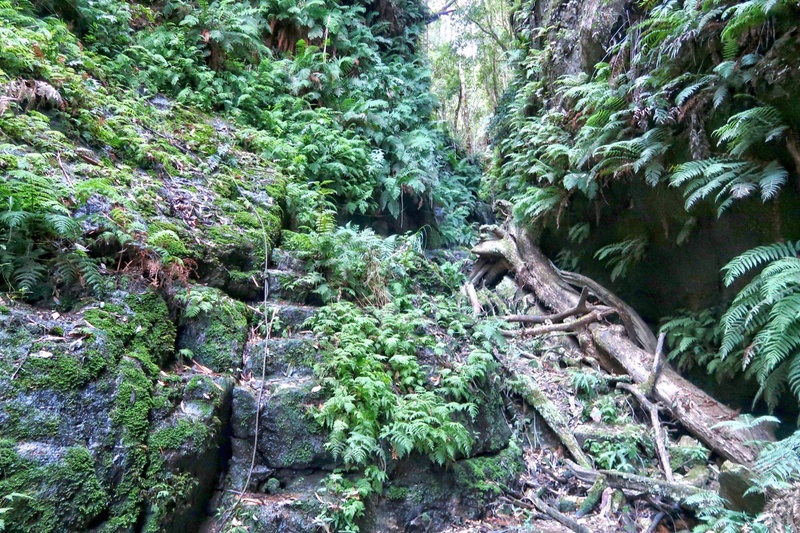 There is a foot track leading away in the south-west direction. We walk on it for a little while. Nothing much along the track ... 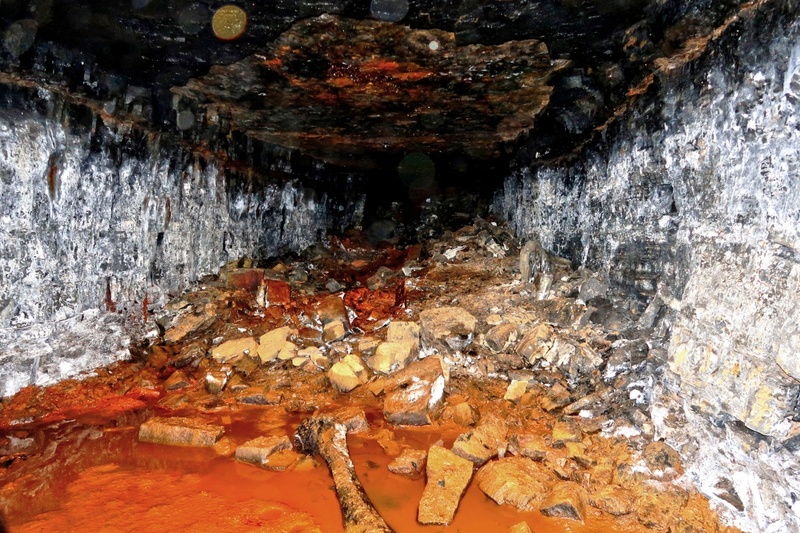 In particular, we can't find any more coal mine adits; and so we turn back. The foot track is not marked on the maps, and we don't know where it leads to. Probably worth exploring in a separate trip. - YM is the guy in the pic. 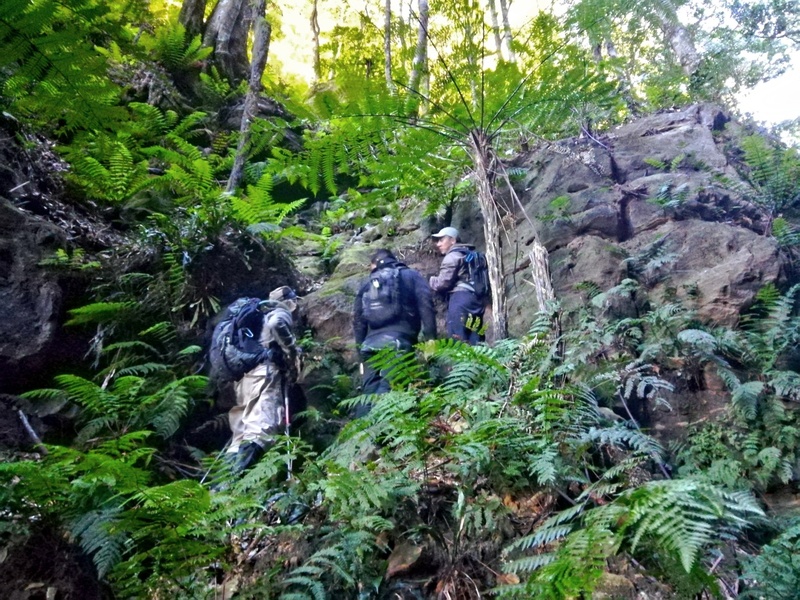 26) After crossing Lindeman Pass, we start by walking higher up on the west side of Lawton's Creek ... easier than walking close to the creek. 27) By contrast, a month ago, we walked along the course of the creek. It was slightly harder that way ... more climbing to do. 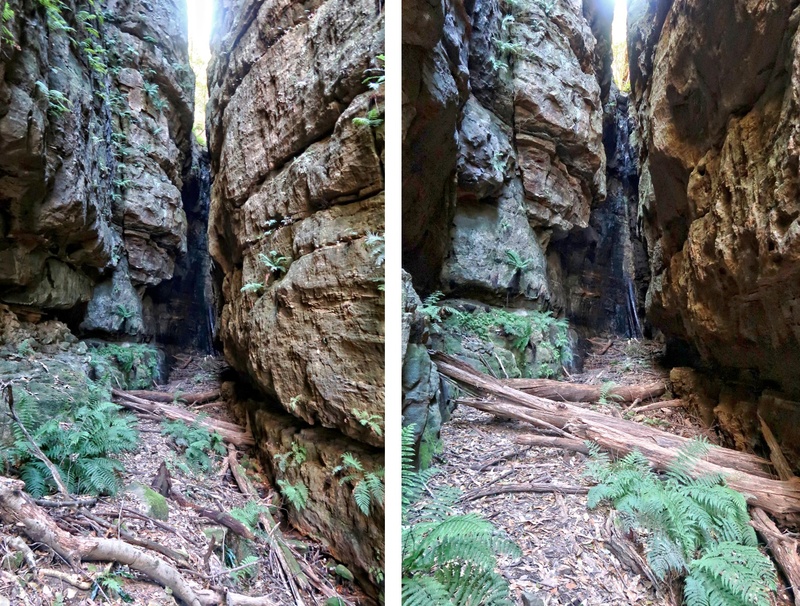 - Both routes will meet up about 50 meters north of Lindeman Pass. - In the pic, James is leading, followed by AC. 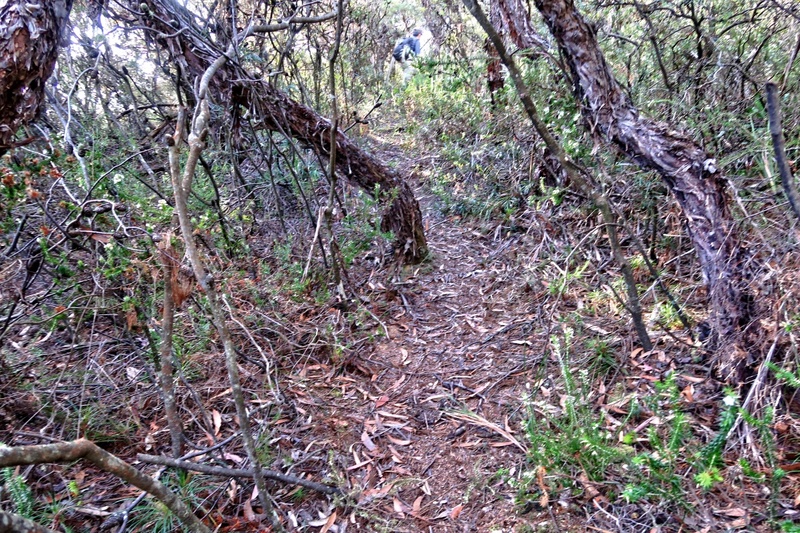 28) Climbing up along the course of Lawtons' Creek ... This pic was taken a month ago. 29) Both routes (the one we took last month and the one we are taking now,) meet up around here, at where AC finds a metal bracket. In the pic, the metal bracket was lying on top of the large rock next to him. He is now going to haul it all the way to the first obstacle ... Refer to photos #33 and #35. - The 2 pics here were taken last month. I don't have any close up pictures of the first obstacle from today's trip. Photos #32 to #35 below were from last month's trip. 32) At the first obstacle, GR 546 649 ... picture taken a month ago. 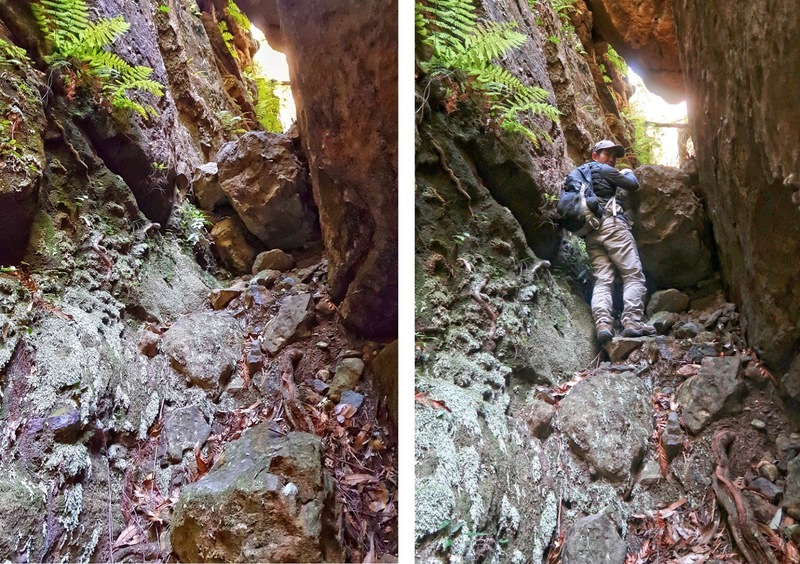 - It is not easy to climb up this rock face. Although AC and YM have no problem in doing so. 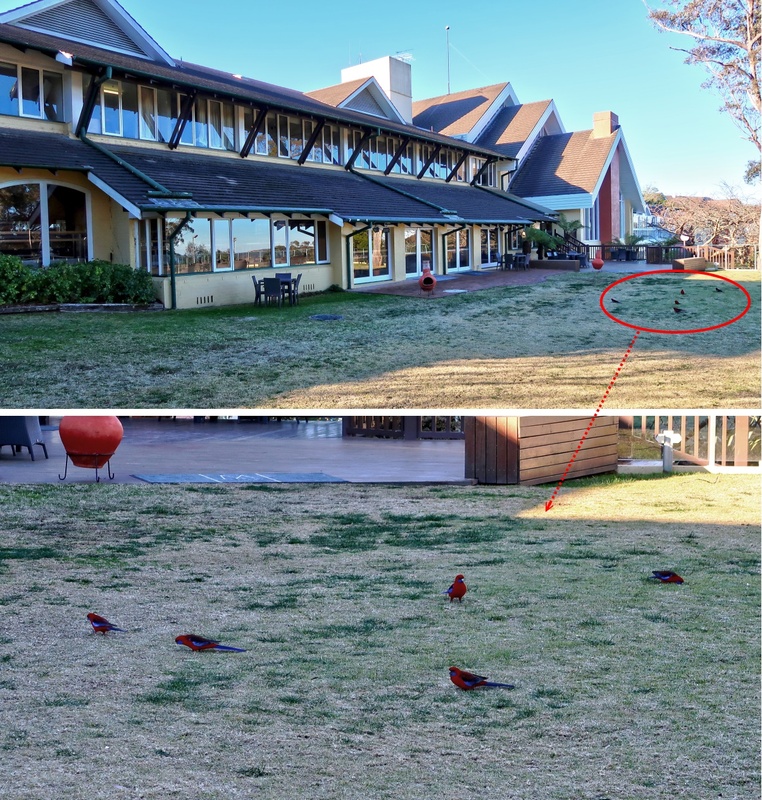 - Red oval: Don't put your weight on the Grass Tree as its roots are shallowly anchored. 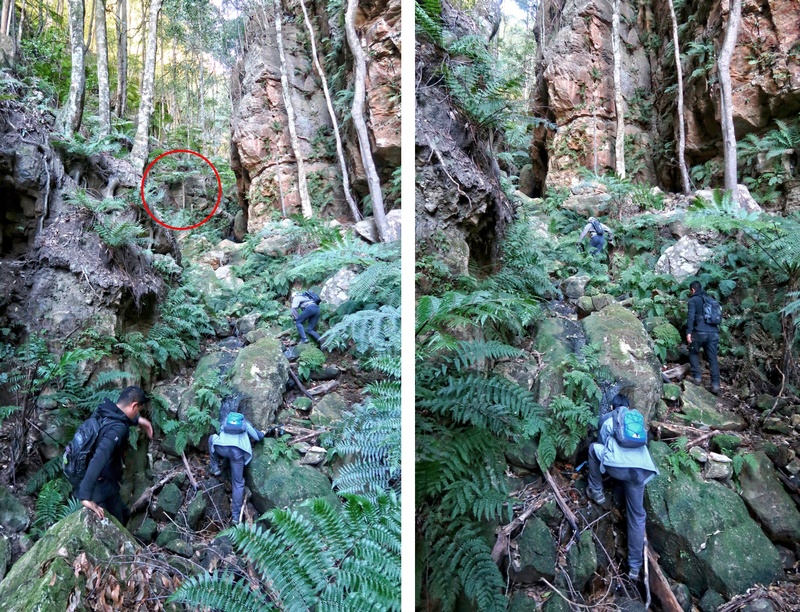 - As one can't hold onto the Grass Tree in the red oval, it becomes quite difficult to climb up. 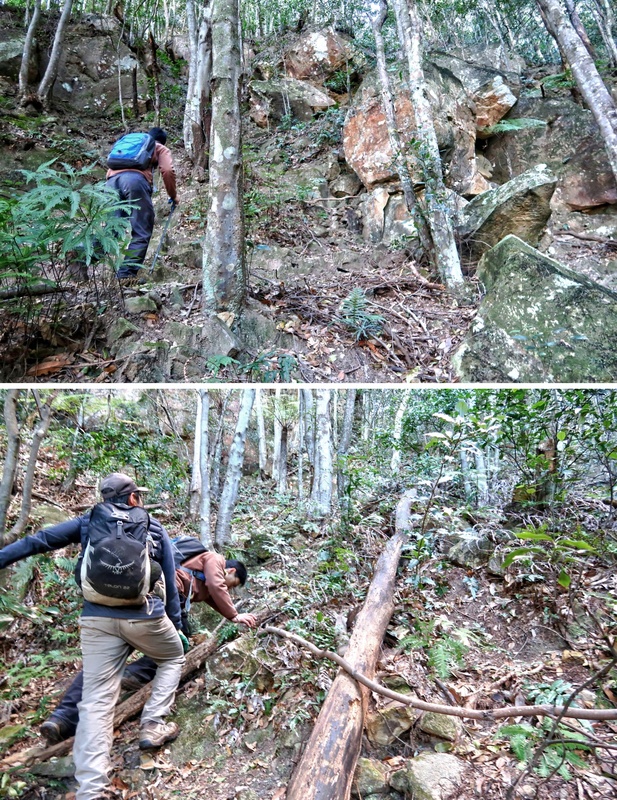 AC and YM are able to scramble up without aid; whereas I require a hand from YM (this trip) and AC (last month) to pull myself up. 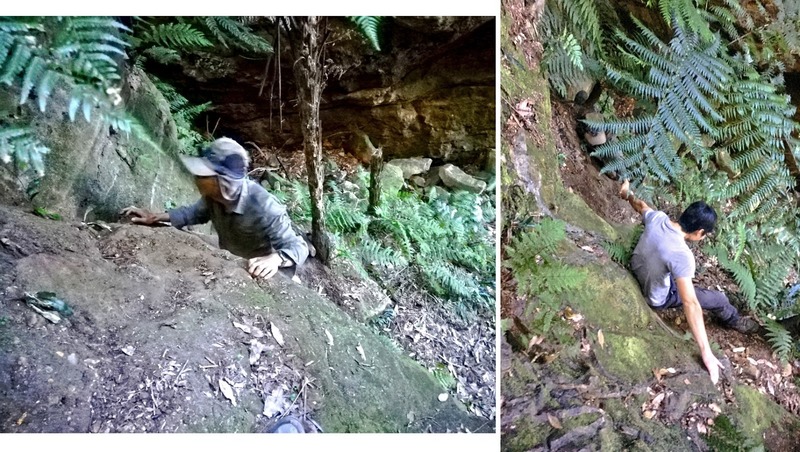 34) - Left pic: Last month, AC took this picture of me climbing up to exactly where he was in the previous pic. I found it not easy to push myself up. 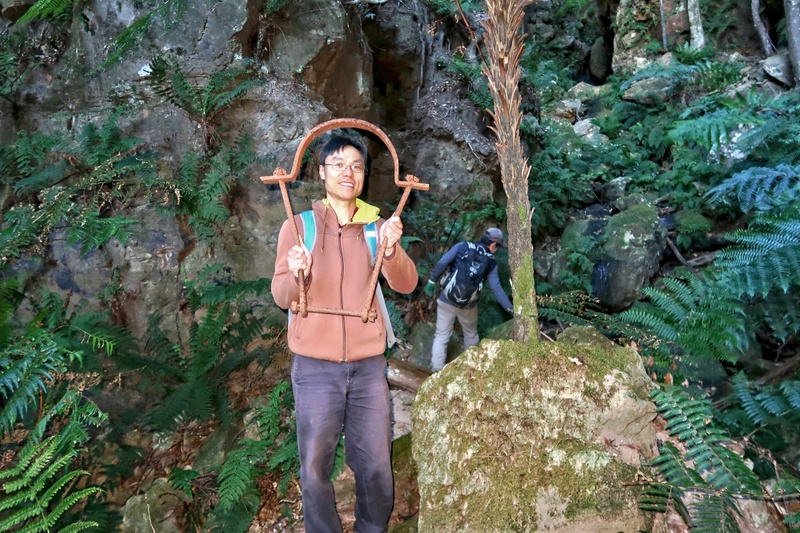 Last month, we went all the way to the narrow cave (photos #43 to #46). But we were unable to chimney up from inside its walls. 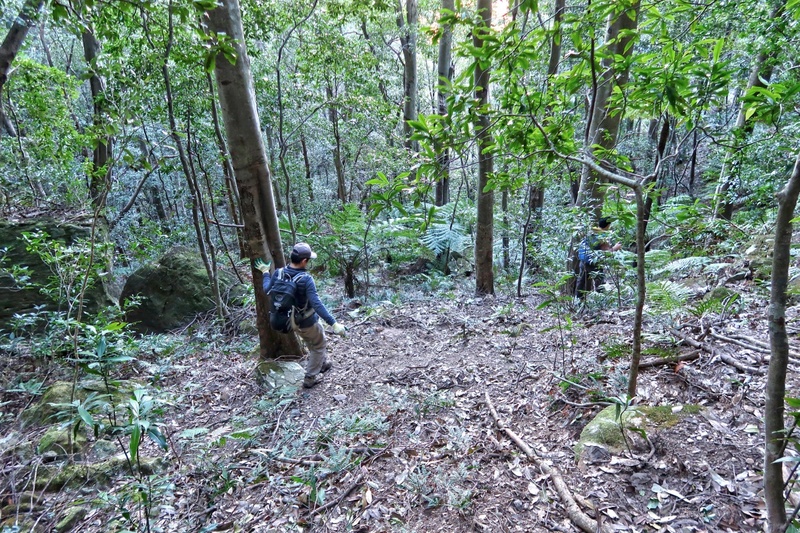 And so we turned around and were back to here to climb down the first obstacle. - Small figure near top of pic: Me ... Letting down a climbing tape for others to climb down. - Centre of pic: James in action. 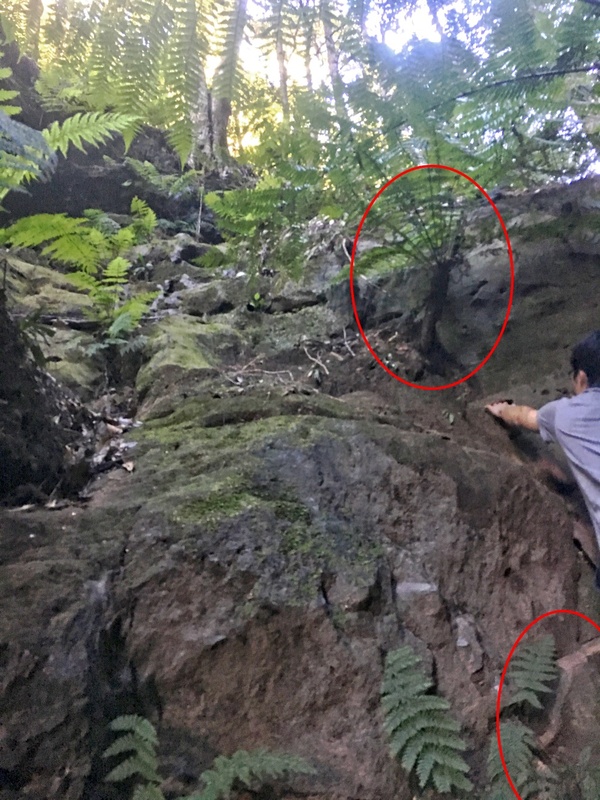 - Red arrow: When we were here earlier on, we stepped on this log to climb up the rock face. 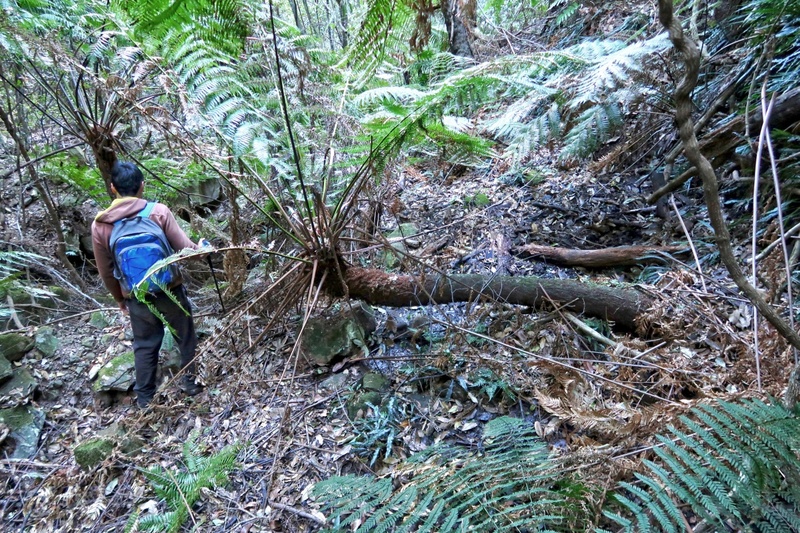 - Upper red oval: Grass Tree which cannot be relied on to pull yourself up ... Refer to photo #33. - Lower red oval: Today, AC places the metal bracket here ... the bracket he hauled from photo #29. As this pic was taken last month, hence the bracket is not shown here. But if you come here now, you should see it, unless it has since been removed by someone. 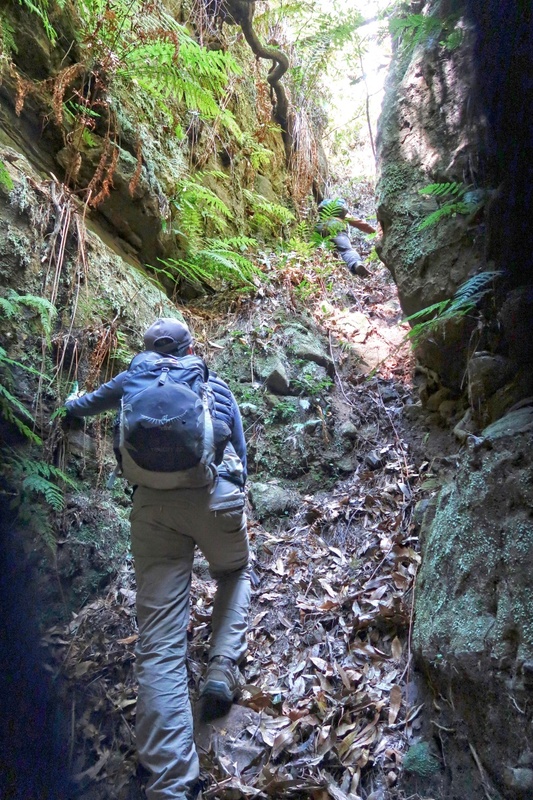 36) After climbing over the first obstacle, we are now on our way up Lawton's Creek to the second obstacle, a narrow cave. 37) We come to the start of Lawbeck Pass ... a narrow cave, GR 547 650, where we'll go inside and chimney up its walls. 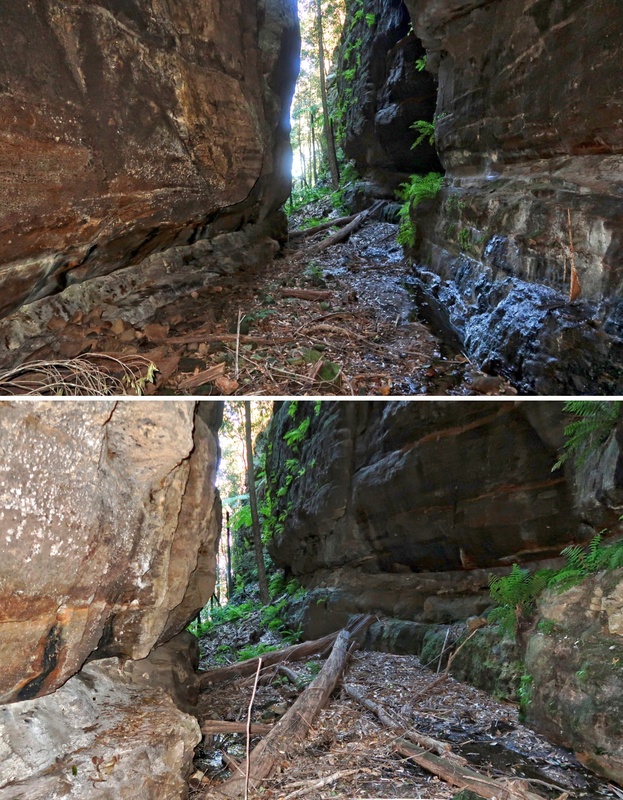 - Red oval: The narrow cave ... on the east side of Lawton's Creek. - Lower yellow dot: From inside the cave, we'll chimney our way to there. - Upper yellow dot: I'll be standing there in photo #49. 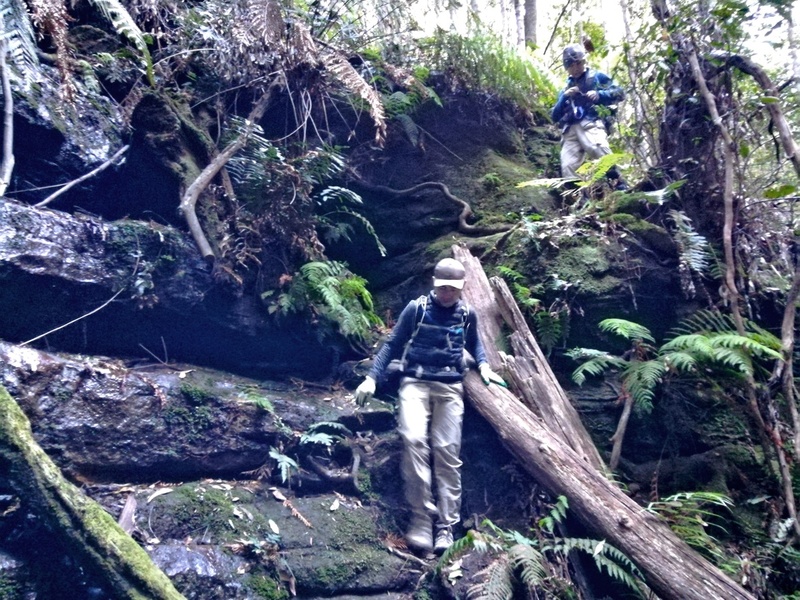 39) While having lunch, we explore around ... go upstream towards an almost dry waterfall. There hasn't been much rain for a long time. - Only a few drops of water dripping down from the top. - It is very dark here even at midday. 42) Retracing our steps back out of the waterfall. 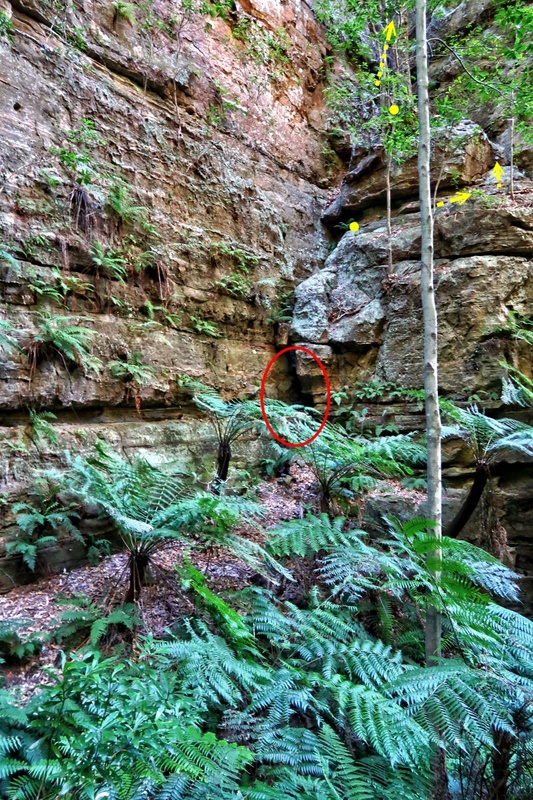 - Yellow dot: From inside the cave, YM will chimney his way to there. Then from there, he will help AC and me to climb up (photo #48). 44) Similar to the previous pic and also photo #37. 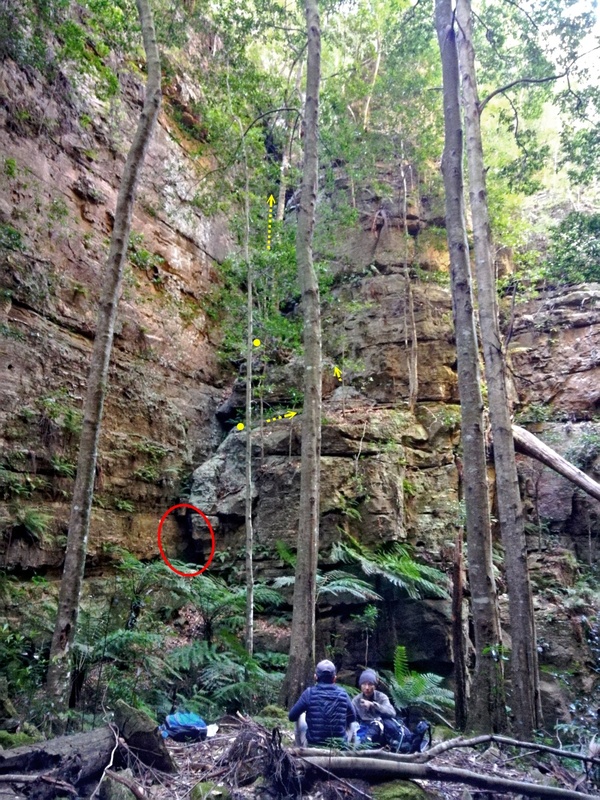 This pic, taken by AC, has an overall view of the cliff above the cave; in particular, the long steep ramp we have to climb up (the long vertical yellow arrow). - Arrows, dots, oval: Refer to photo #44. 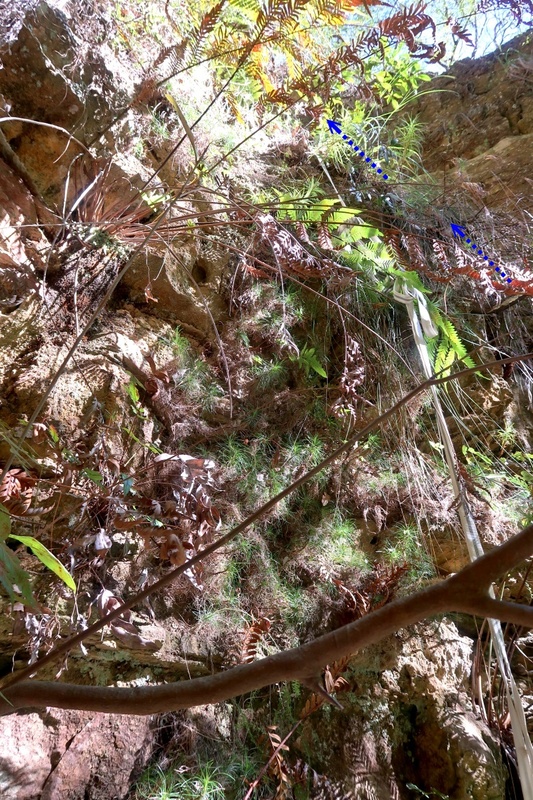 The second obstacle of this trip is inside the very narrow cave. Inside, one needs to chimney up the vertical walls. It looks impossible and impassable. The genius of Michell Lindbeck was he thought it worthwhile to scale up in 2016. No one with a sane mind had tried it in all the past centuries ! - Left pic: AC goes in. - Right pic: YM has stepped on AC's shoulders to reach where he is now. Even with the help of AC's shoulders, it is a very difficult climb. 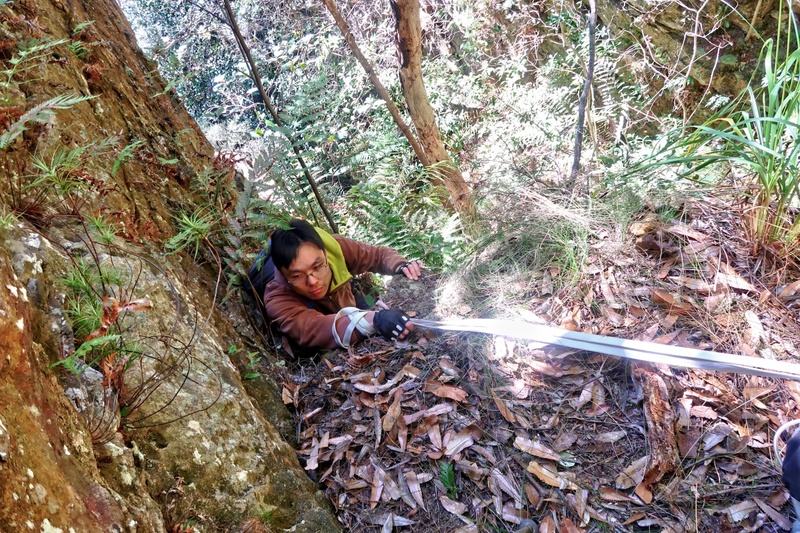 47) YM has climbed up and dropped down a climbing tape for us to haul our backpacks up. We then use the same tape to help ourselves up. - Press your back against one wall. - Press your knees/feet against the opposite wall (easier said than done due to the narrowness of the space available). - With your hands pressed against the walls (and sometimes use the tape), slowly inch yourself up. It is difficult. It takes us ages to get the knack of it. Eventually, we'll emerge out of the top of the wall ... which is the lower yellow dot in photos #37, #44 and #45. 48) I've chimney up the narrow cave !!! - YM is helping AC to climb out of the cave. His position is the lower yellow dot of photos #37, #44 and #45. 49) I am now at the upper yellow dot of photos #37, #44 and #45. 50) The previous pics were looking down. Spin around 180 degrees and looking up is a long steep ramp. 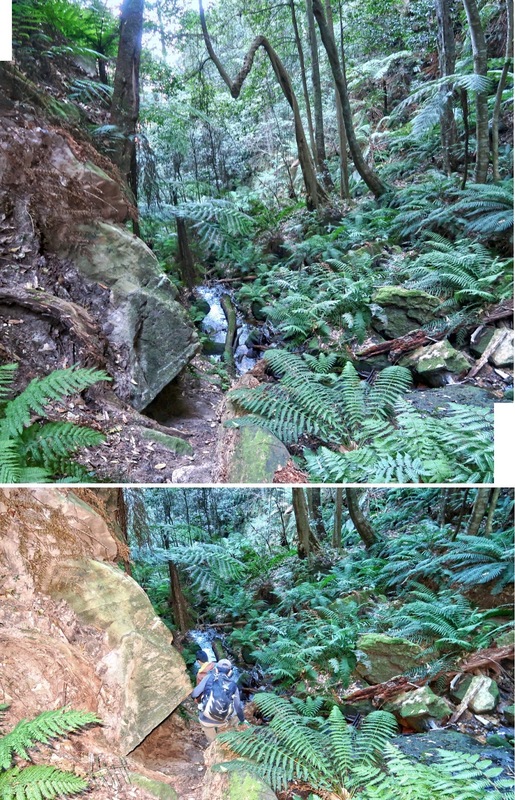 This is the long vertical yellow arrow in photos #37, #44 and #45. 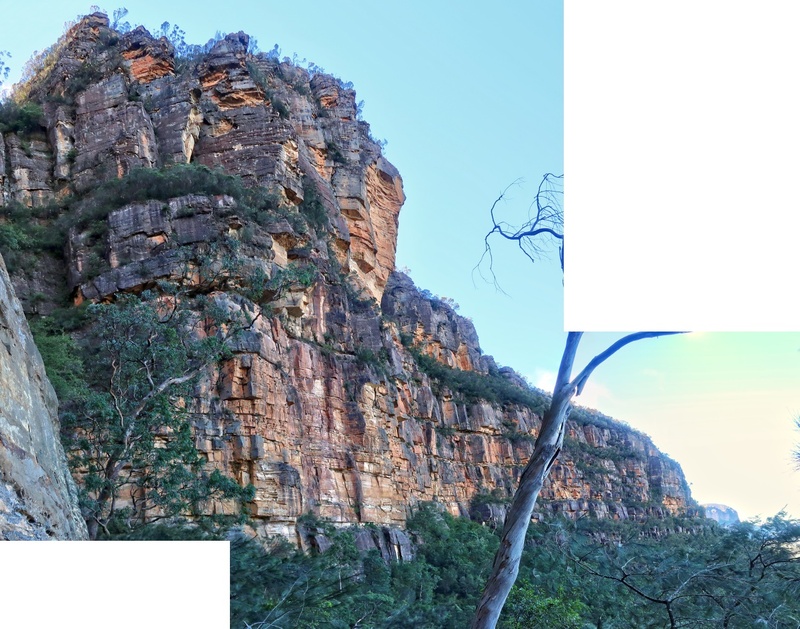 51) I've climbed over the big rock in the middle of previous pics. - The ramp is filled with loose leaf litter, with loose rocks buried under the litter. - Let one guy climb up first. Don't follow him as every now and then a rock gets dislodged and tumbles down. If you are behind him, you can be in trouble. - YM is safe from the tumbling rocks as he is protected by a pile of rocks in the middle of the pic. The top of the ramp (previous pic) is an embankment about 2 meters high. It seems to be the start of a landslide that filled the ramp with earth and loose stone. Then later on, leaf litter covered its surface. AC and YM were able to climb up the embankment. When it is my turn, I have troubles. - When facing the embankment, to my left is a thin juvenile tree that I'm not willing to put my whole weight on to pull myself up. - There are some tree roots protrude from the embankment. But they don't seem to be able to hold my weight. 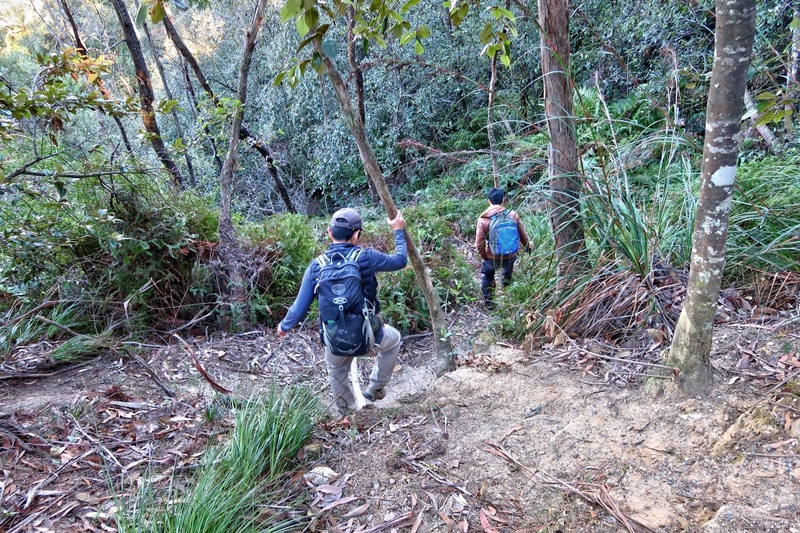 After the long steep ramp, just keep climbing up the obvious way. Very soon we come to an almost vertical place. 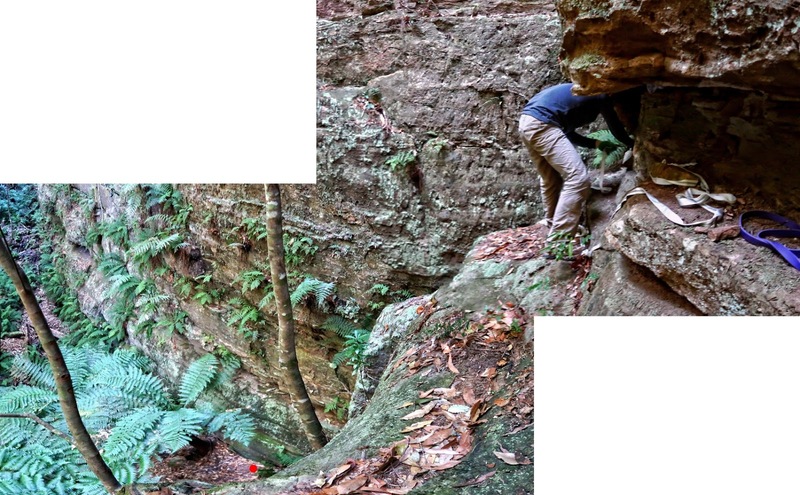 52) This is an exposed climb. 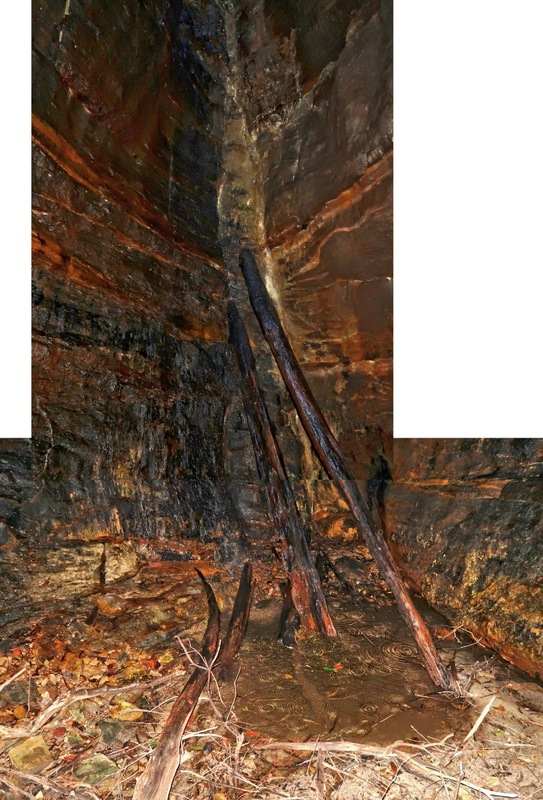 - Initially the tape was draping down the left side of the tree trunk (the tree across the lower part of the pic.) 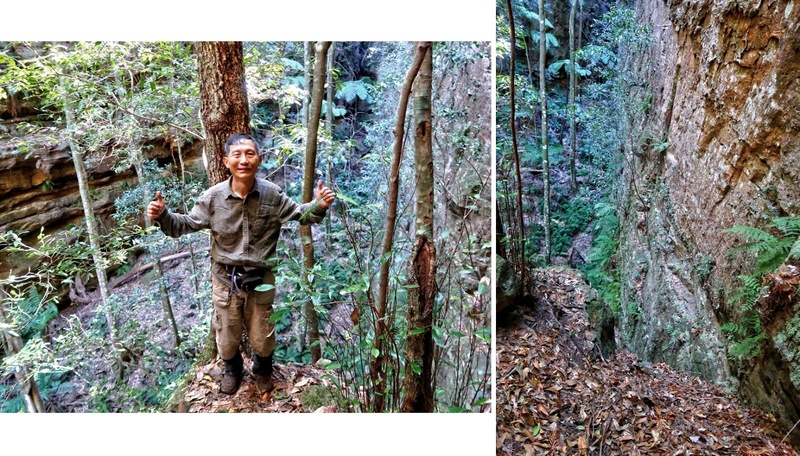 AC and I used the tape to help us to cross a short exposed ledge to the right side of the tree. - The tape is then switched to the right side ... as is depicted in this pic now. - Then we use the tape to climb up ... along the blue arrows. 53) I have already climbed up to the top of the blue arrows of the previous pic, now taking a picture of AC climbing up. 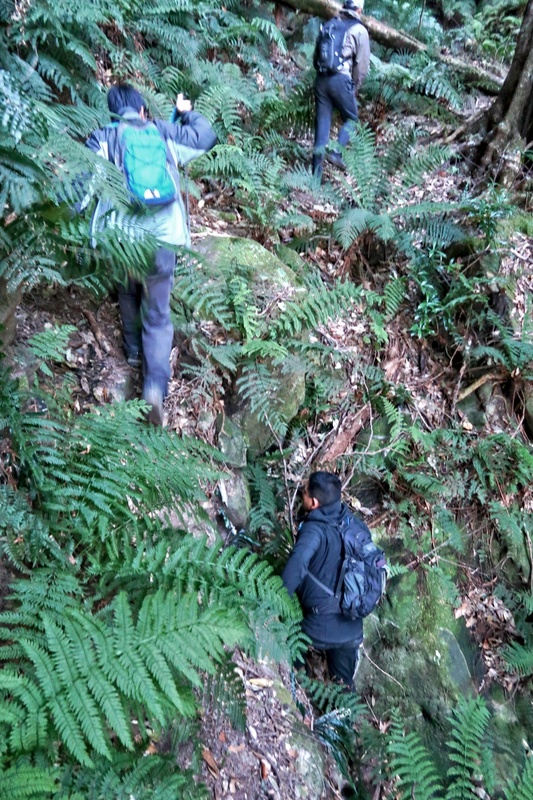 Standing at where the previous pic was taken, we immediately face our fifth and final obstacle ... climb up another cliff. Unfortunately I forgot to take some photographs of this area ... 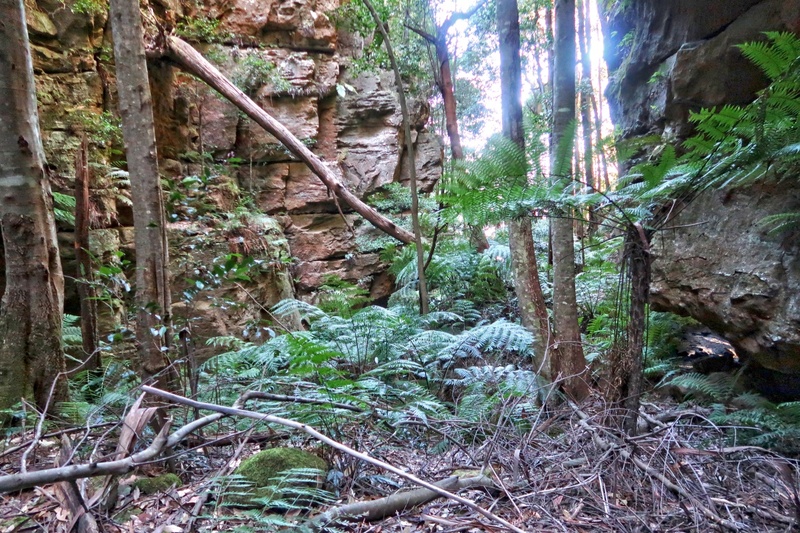 It is a slight recess/grove in the rock cliffs. There the cliff is made of loose earth and rocks. 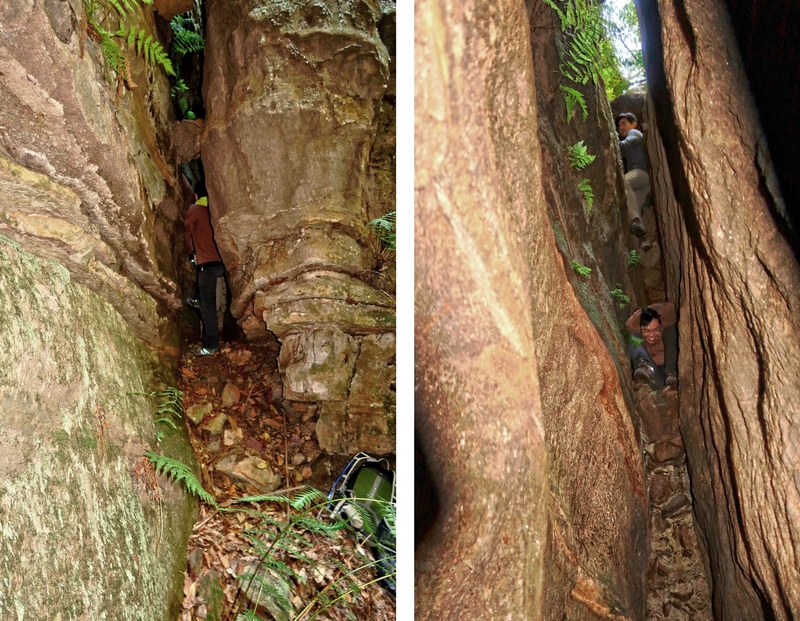 A mid-sized tree is nearby where, when climbing up, one can temporarily press one's feet on its trunk for a breather. YM climbs up first. 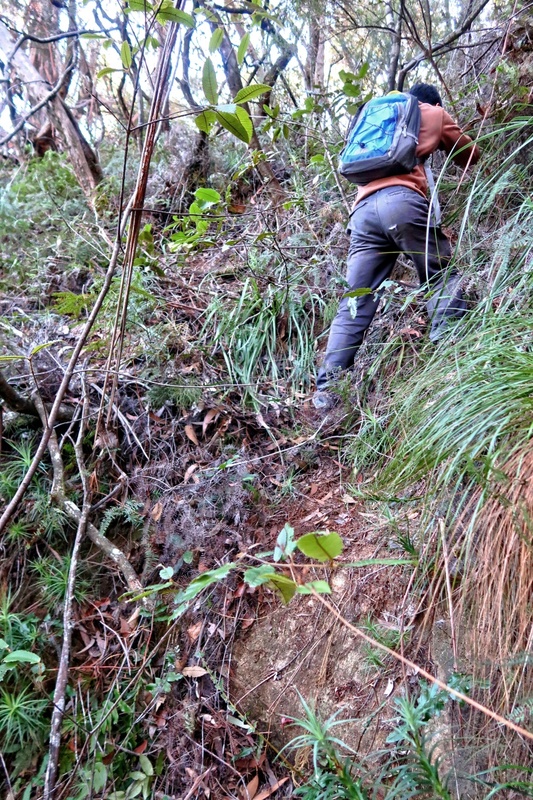 It is a difficulty climb even for him. He has two goes at it before succeeding at the third attempt. I hate to think what would happen if he fails ... don't fancy retracing our steps all the way back !!! 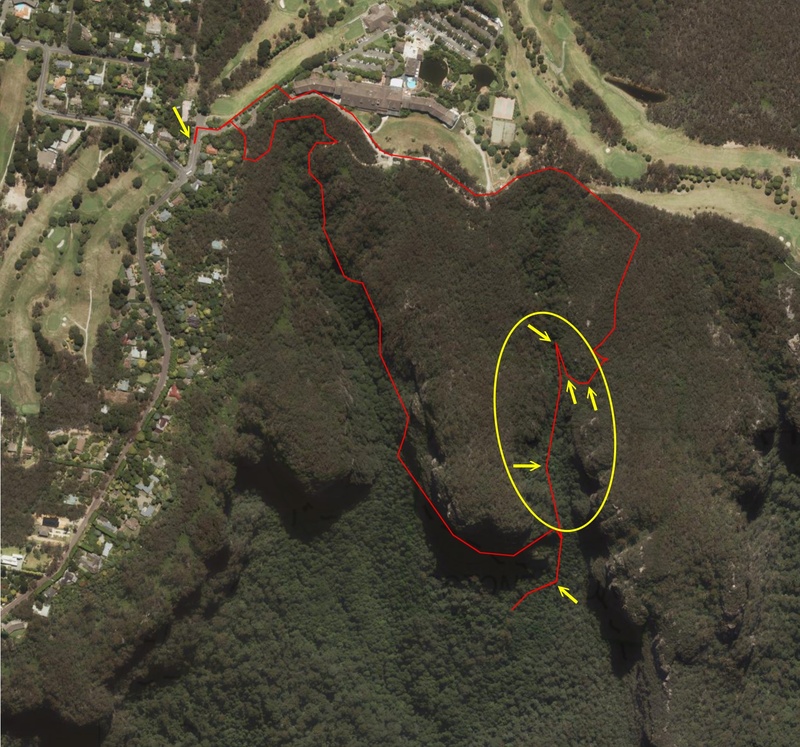 After the 5th obstacle, we bushbash towards Fairmont Resort / Leura Golf Course. - AC is the guy in this pic. 55) We meet up with a foot track. 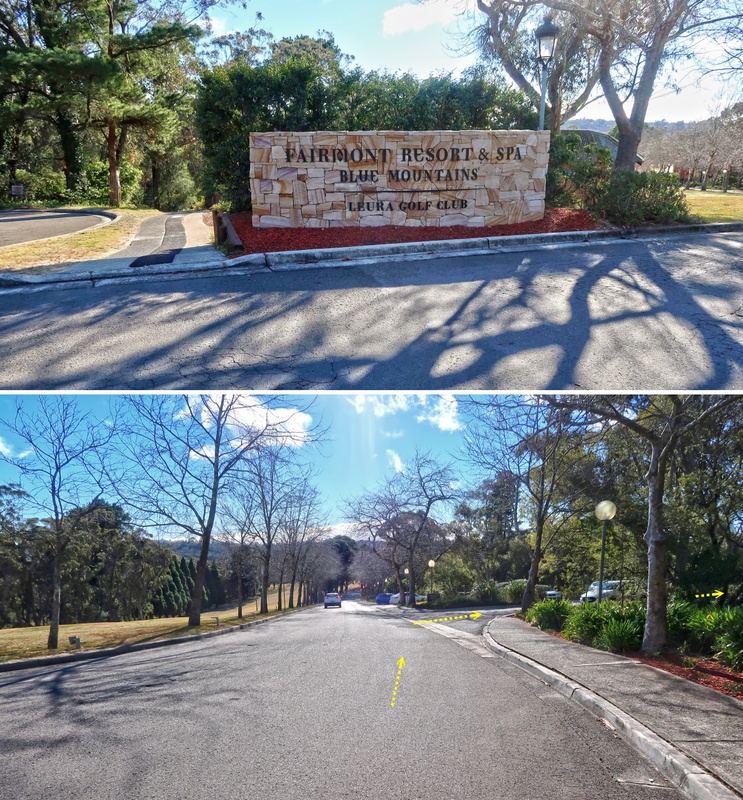 One direction goes to Fairmont Resort / Leura Golf Course. We have no idea where does the other direction lead to as the foot track is not marked on the maps. Perhaps it goes to Gladstone Lookout? 56) We are passing the back of Fairmont Resort. Then it is back to my car at Sublime Point Road. There is not much view in this walk. 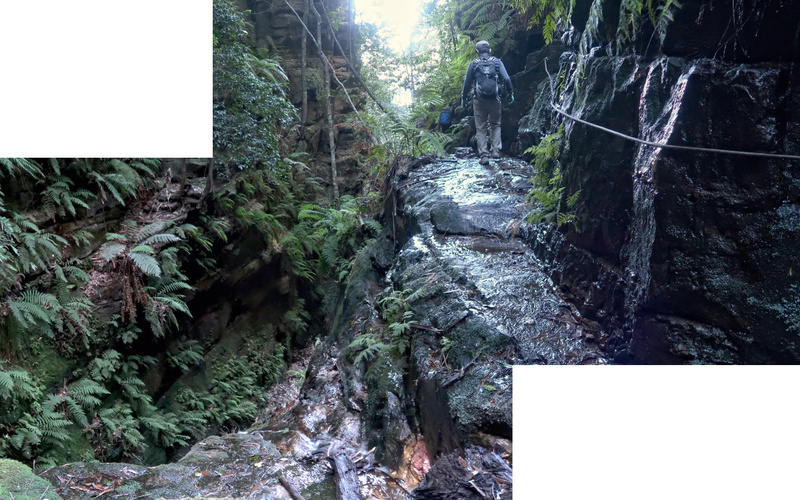 But the challenge of climbing up many difficult obstacles in Lawbeck Pass is well worth the effort !